Fireball Fuchsia. 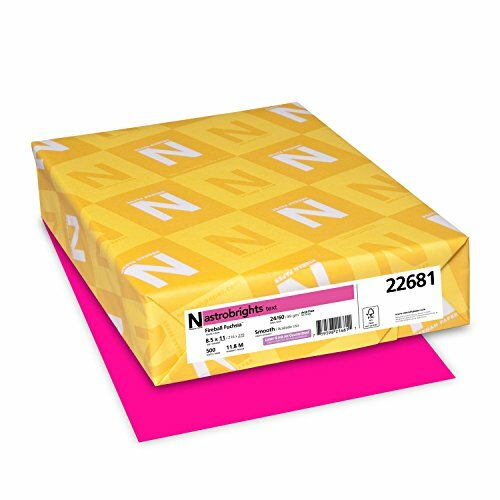 Neenah Astrobrights Premium Color Paper, 24 Lb, 8.5 X 11 Inches, 500 Sheets, Astrobrights Color Papers and Cardstock These are the original bright colored papers. At home, school, and in the office, these are the bold, deeply saturated colors that get all the attention - direct mail stands out, announcements are read, invitations are seen, bulletin boards are brighter and paper crafts are more fun. The whole point is to convey a message and Astrobrights colors do it in a big way. Available in two weights: 24 lb. Writing (89 gms) and 65 lb. Cover (120 gms). Bright Colors Inspire Your Creativity Card Making, Paper Crafting, Invitations, Table Décor, Home Accents, Organization, Photo Mattes, Scrap Book Pages, Handbills, Posters Generate Bright Ideas in the Classroom Art Projects, Bulletin Board Décor, Event Notices, Handbills, Calendars, Organization, Team Rosters and Schedules, Divider Pages, Programs, Class Assignments Bright Colors are Good for Business Coupon Offers, Event Promotions, Announcements, Brochures, Newsletters, Direct Mail, Flyers, Sell Sheets, Notices, Posters Benefits of Astrobrights Papers and Cardstock Consider these findings from GA Wright Marketing, Inc., Color Matters, and Color Marketing Group: •Print pieces that make use of bold color generate a 33% higher response rate. •48% more people respond to high-quality paper over low-quality paper. •Color paper utilizes less ink than traditional white paper alternatives. •Color accelerates learning from 55 to 78 percent. •Color increases retention by 18 percent. •Color increases comprehension by 73 percent. •Color improves readership by as much at 40 percent.